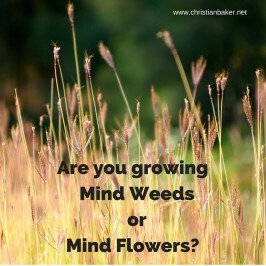 Are you growing and nurturing Mind Weeds or Mind Flowers? Your thoughts are like little seeds growing in the fertile soil of your inner mind, they either grow into flowers or weeds, if you nurture the right seeds you will get to enjoy some mind flowers and harvest a better tomorrow. On the flip side, if you ignore and neglect the weeds, they will take over and often get stronger and stronger, ant stifle your potential. So take a little time to get your weeds in order and decide which seeds you are going to sow and the rest of your life will run far smoother.